One Mom's Moxie: S'More Maker Flash Giveaway!!! Welcome to the Wacky Wednesday Pay It Forward S'more Maker Giveaway! You only have 4 hours to enter to win this fun S'More Maker by Kalorik. Don't miss out! 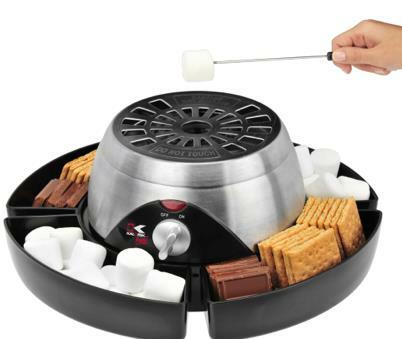 This S'More maker looks super fun! I would love to win this for Valentine's Day! When I went camping a few years ago! It was last summer. I got together with some friends and had a cookout in their backyard. Before my divorce, we had campfires just about every other weekend in our backyard. I suppose the last time I had one was back in August or so. Would LOVE to be able to make them with my daughter in our apartment!! How much fun would it be to make s'mores on our apartment patio?? Probably last summer...made it in the,microwave...not as good that way! We make s'mores every summer! My kids would love this!!! I made Smore pops last Saturday for my daughters bday. They turned out good but still not as good as a traditional Smore. I was just looking at something along these lines today. Not as nice as this one. Years and years but love em. Oh my goodness! I see these often and think, "I really should get one of those!" I haven't had a smores in so long. Far too long!